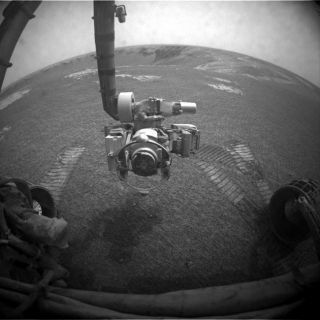 NASA's Mars Exploration Rover Opportunity used its front hazard-identification camera to obtain this image at the end of a drive on the rover's 1,271st sol, or Martian day (Aug. 21, 2007). Victoria Crater, site of the rover's next scientific target, lies ahead. After sixweeks of waiting out globe-engulfing dust storms, NASA's Mars ExplorationRovers have resumed driving across the planet's surface. With theimproved energy supplies, mission managers said Spirit and Opportunity are backon schedule to doscience. During the storm, both rovers stood still and cut back normalcommunication to conserve energy. "Weatherand power conditions continue to improve, although very slowly for bothrovers," said John Callas, project manager for the mission at NASA's JetPropulsion Laboratory in Pasadena, Calif. Despite theenergetic progress, the rovers aren't outof danger yet. Dust that was lifted into the air "could take months"to clear, said rover Project Scientist Bruce Banerdt. "There is a lot ofvery fine material suspended high in the atmosphere," Banerdt said, notingthat the dust is accumulating on the rovers' energy-gathering solar panels. Rover panoramic camera scientists said that the sun was nearly blotted out during the peak of the dust storm, as shown in an image released today. Although 99 percent of direct sunlight never made it to the rovers' solar panels, indirect sunlight glowing through the dust charged the rovers' batteries enough to warm and protect delicate circuits from snapping. Now thatthe storm is clearing, rover scientists are eager to roll Opportunity insidethe 2,400-foot-wide (730-meter-wide) Victoria Craterand scope out its inner slope. "Thisis a magnificent crater with a lot of exposed bedrocks and walls showinggeologic detail with extensive layering that makes the team geologist veryhappy," said Thanasis Economou, a senior scientist at Chicago's EnricoFermi Institute. "What you can see is amazing." Opportunity's descent was delayed when thedust storms began in mid-June. Mission managers, however, are stilldeciding when to continue the much-anticipated crater dive. Meanwhile,Spirit's microscopic imager has been sprayed with dust from the storm toslightly reduce its image quality. The team is experimenting with ways to trydislodging dust on the lens and is planning to drive the rover onto a platforminformally named "Home Plate." Both roverswill start a new atmosphere-monitoring project using their Alpha Particle X-raySpectrometer (APXS) instruments, which engineers initially designed to examinerocks and boulders on the surface. The APXS instruments will measure argon,which the orbiting Mars Odyssey spacecraft discovered is responsible for mixingthe thin martian air between summer and winter. Scientistshope the rover's finer measurements from the ground will reveal someclimatological secrets of Mars. "Itgives you a way of inferring aspects of the Martian circulation that you can'tobserve at all with any other instrument that's out there," said Ray Pierrehumbert,a planetary geophysicist at the University of Chicago in Illinois.